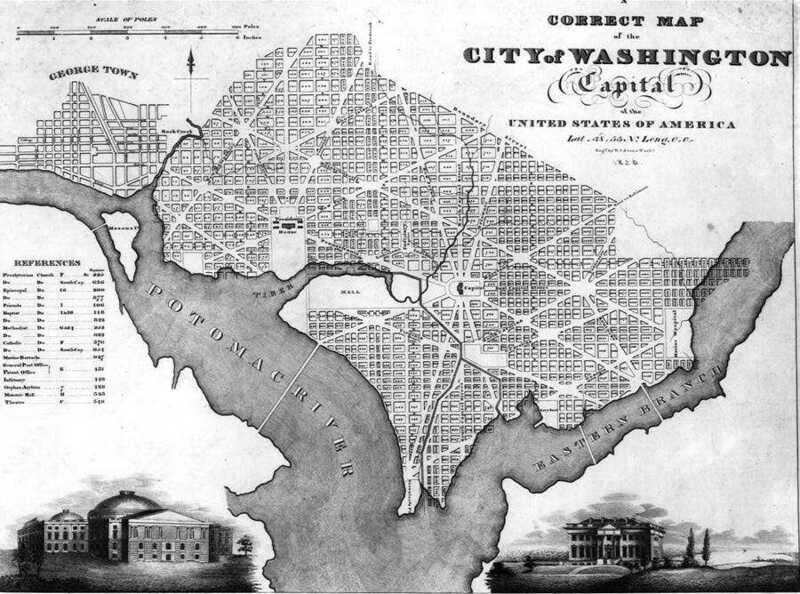 Pre-Washington DC — “Tiber Island” is derived from the name of a creek that was here long before the city of Washington and when this area of Southwest Washington DC was surrounded by water. Originally called Goose Creek, it was renamed ‘”TheTiber” after Rome’s Tiber River when the area around it was selected as the new capital of the United States. Later, the area surrounded by The Tiber, James Creek, Eastern Branch and the Potomac River became know as “The Island” with a bustling waterfront and a prominent community. Old Washington DC — In 1796 Thomas Law and his wife, Eliza Parke Curtis, granddaughter of Martha Washington,were local residents and their home became known as the Thomas Law House. Thomas Law was instrumental in converting the creeks to canals in 1816 with locks to move boats from Georgetown to wharves on the Eastern Branch. The historic Thomas Law house is now on the Tiber Island property. Over time, Southwest evolved as a multi-ethnic working class community with bustling shops, churches and synagogues. Thanks to former slave and educator, Anthony Bowen, Southwest Washington even became a stop on the Underground Railroad. Various well-known individuals have Southwest roots. Urban Renewal — In the 1950 and 60’s, Southwest was chosen as the country’s first area for Urban Renewal. The Master Plan of Urban Renewal brought new ideas of urban living. It resulted in the closing of some streets, pushing together smaller blocks to create ‘super block’ areas with no alleys. Much of the waterfront was reserved for public access with parks for walking and boat access. Residential development in the area included towers and townhouses with mostly underground parking. The changes brought new residents to the area, including Sen. Hubert Humphrey and Supreme Court Justice Thurgood Marshall. In keeping with these new ideas and in distinction to the traditional city designs with towers next to one another, Tiber Island was designedby noted architects Keyes, Lethbridge and Condon and built in 1965 in a pinwheel shape with a large courtyard and town houses in the quadrants and incorporated the original Thomas Law House. The Tiber Island design won the American Institute of Architects award for Multi-Family Residential design in 1966.